Aksel Lund Svindal won gold in the men’s downhill for Norway. JEONGSEON, South Korea — Norway’s Attacking Vikings stole the show at the Olympics men’s downhill on Thursday. 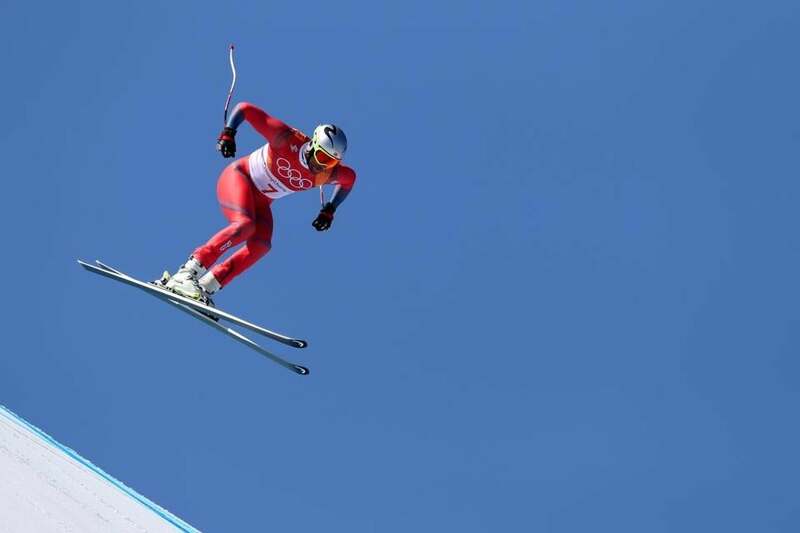 Aksel Lund Svindal and Kjetil Jansrud posted fast early times and then watched as 48 more skiers attempted but failed to top them. Svindal, the seventh skier to go, set an early benchmark on the Jeongseon course, and it held up for the gold medal. Two skiers later, his teammate Jansrud proved to be the strongest challenger but he was .12 seconds off the pace and took silver. Switzerland’s Beat Feuz, the World Cup leader, took bronze, .18 behind for his first Olympic medal. After being postponed because of high winds on Sunday, conditions were near-perfect for the start of the downhill on Thursday, with bright blue skies and calm air. But as the race progressed, some wind developed, and US skier Jared Goldberg said that slowed the skiers who were later in the start order and faced some headwind. US coach Johno McBride said that if the race was run a half-hour earlier, as originally scheduled, things might have been more favorable for the starters after No. 10. The four US starters – Bryce Bennett, Goldberg, Wiley Maple, and Ryan Cochran-Siegle – all started later and were more than a second behind the leader. Bennett started 14th and finished 16th, 1.97 seconds off the pace. Goldberg was 20th, Cochran-Siegle 23rd, and Maple was 30th. Bennett said the Norwegians have set the gold standard all season on the World Cup circuit, and Thursday’s outcome was no surprise. “They just have all their ducks in a row, and it shows,” Bennett said. Complicating matters was that the Jeongseon downhill course, which was designed by famous course designer Bernhard Russi, a Swiss former World Cup ski racer, has four planned jumps and racers were catching air as many as 11 or 12 times. Goldberg said when you add wind into the equation, it made for a tricky run. “The landings were pretty hard today because when you have wind, it holds you up in the air. It catches your chest and you kind of fly, like you squirrel-suit a little bit,” he said. Goldberg also said he could tell that, after experiencing the course in training runs and the race, the wind slowed him considerably. The downhill began at an elevation of 4,494 feet and drops some 2,706 feet over the length of the course, which is 9,727 feet. Feuz, with three victories and a top-10 finish in all seven events he’s raced this season, leads the World Cup downhill standings by 40 points over Svindal, with Italy’s Domink Paris a distant third. Svindal has two wins and has also been in the top 10 in all seven events. While pleased to finally capture gold to add to a lengthy list of accomplishments, Svindal said there’s at least one more goal to attain. “I haven’t won Kitzbuehel [the famous Austrian downhill race], so nothing’s complete,” Svindal said.